Braner USA Shape Correction Roller Levelers are designed to transform carbon steel, stainless steel, aluminum, and high-performance alloy flat rolled coils into a panel flat strip by eliminating common strip shape defects such as coil-set, wavy-edges, and center-buckle. Braner USA levelers are massive rigid machines capable of precisely applying work roll force uniformly, or at specific points, across the width of the strip. Work Roll Positioning: Braner USA Roller Levelers employ the modern "hydraulic" work roll and back-up positioning technology. Upper work rolls and back-ups are attached to a massive upper frame and are fixed in elevation at the strip pass line. Adjustable elevation lower work rolls and adjustable back-up flights are housed in a floor mounted base frame. Four huge pre-stressed corner posts unite upper and lower frames. All lower back-up flights, including the extreme outer flights, are vertically adjustable via independently controlled hydraulic cylinders that support the extreme ends of each lower back-up flight. Front-to-back work roll "tilt" is accomplished by adjusting the relative elevations of the hydraulic cylinders supporting the entry and exit ends of the back-up flights. Work roll "bend" is accomplished by adjusting the relative elevations of the hydraulic cylinders from side-to-side . . . from one back-up flight to another. Because the entry end cylinders and the exit end cylinders can be adjusted independently, the leveler's entry work rolls can be "bent" for aggressive shape correction, while the exit work rolls can be positioned with minimal roll bend or positioned parallel. Independent entry and exit roll bend allows for precise shape correction without overworking the strip. 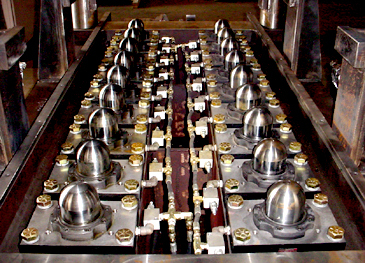 The hydraulic cylinders employed to position the back-up flights and lower work rolls are equipped with precision non-contact linear electronic transducers. The electronic transducers have a repeatability accuracy of +0.001% of full stroke, and are designed for 3,000 PSI dynamic and 8,000 PSI static loading pressures. Automatic Leveler Set-Up & Calibration: Braner USA Hydraulic Levelers are equipped with automatic roll positioning, and automatic leveler calibration, features that minimize the "art" of leveler set-up and makes regular calibration quick and easy. Material thickness and yield strength data are entered in the leveler controller via keypad, causing the leveler to automatically adjust to a prescribed entry and exit roll gap ideal for that particular gauge and yield strength. Other commands will adjust the leveler to eliminate center buckle or edge wave. Manual overrides allow the operator to make entry and exit roll gap and roll-bend adjustments on the fly. 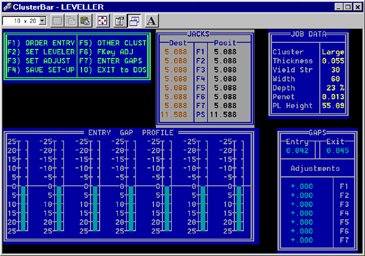 Job numbers can be assigned to the leveler set-up parameters for future recall from the computer memory the next time that particular material is processed, minimizing leveler set-up and adjustment time as well as minimizing scrap. Placing "calibration bars" over each back-up flight and entering the "calibrate" command zeros all the back-up flights parallel with the upper leveler rolls.